Today I decided to write about one of my favorite learning Spanish products, Gritty Spanish 2. I’ve purchased numerous other Spanish dialog collections in the past, and they’ve all been helpful and worth the time, money and effort I invested in them. But none of them have been as interesting and captivating as Gritty Spanish. I’ve found it to be as entertaining as it is educational. I have to admit, when it’s predecessor Gritty Spanish 1 was released, I was pretty hesitant to buy yet another Spanish dialog collection, after all, how different could it be? Well, I couldn’t have been more wrong. After a glowing recommendation from a friend I decided to give it a try and it quickly became one of my favorite products. Needless to say, I didn’t blink an eye when the next version was released. If you’d like, you can also read my review of Gritty Spanish I. But enough chit-chat, let me tell you about Gritty Spanish II and why you’ll like it and how it will improve your Spanish. First of all, if you liked Gritty Spanish I you’ll like Gritty Spanish II because it’s the same great quality product with a few improvements. 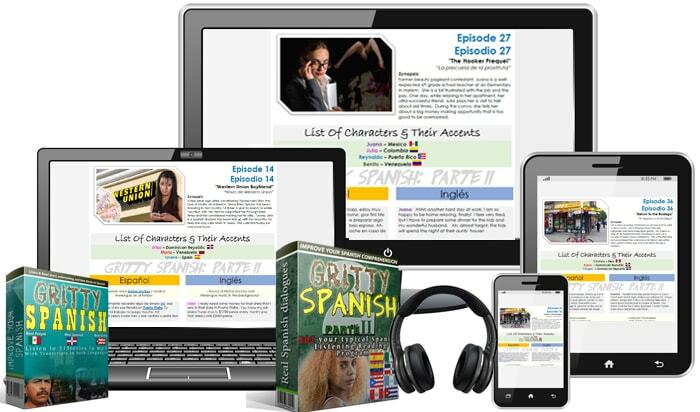 Gritty Spanish 2 , like it’s predecessor Gritty Spanish 1, is a collection of dialogues designed to take the boredom and monotony out of learning Spanish. It does that by using stories set in an urban environment (the streets of New York City). 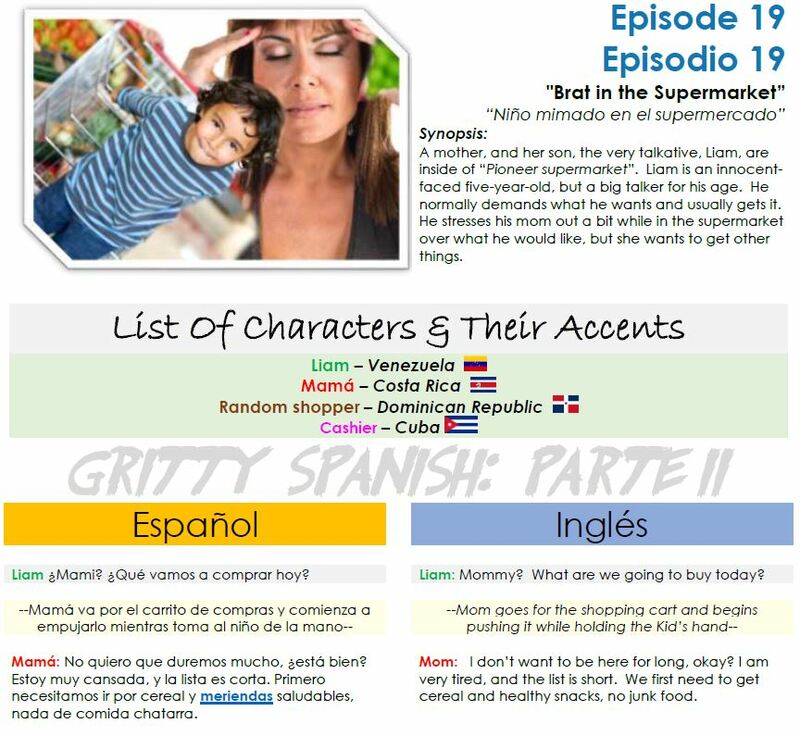 The episodes touch on a variety of everyday topics (and even some not so everyday topics) using coloquial, sometimes colorful and everyday language in dialogues that have been recorded by native Spanish speakers. If the product had to be rated like a movie, it would be somewhere between PG13 and R for adult situations and language. The dialogues are written to reflect how people speak in real life, including swearing and mature themes. While anyone can benefit from Gritty Spanish, the products target audience is everyone from an advanced beginner to intermediate/advanced learners. Regardless of your current knowledge of Spanish, Gritty Spanish will help you improve your conversational Spanish abilities, including your ability to understand spoken Spanish. It will also increase your vocabulary and expose you to how people really speak Spanish in everyday life. Ok, I’m referring to “unboxing” Gritty Spanish in a figurative sense, because you get a zip file, not a boxed product, but let’s talk about what you’ll find in that zip file. There are a total of 36 dialogues recorded at normal speed with sound effects that help bring the conversations and characters to life. The voice actors speak at their normal pace in a very natural manner. If you find the sound effects a distraction, no worries, a second set of files are audio only, no background effects. There’s also a third set of files that have been slowed down by 30%. Also, all of the audio files are conveniently marked with MP3 tags. That makes it nice and easy to manipulate the files on your phone, tablet or MP3 player. A quick glance at the titles reveals that Dorothy is definitely not in Kansas anymore. These are not your average learning Spanish conversational dialogues. In fact, the product tag line let’s you know you’re about to experience something different. Let’s take a look at some of the titles and then you’ll understand why it’s called Gritty Spanish. But Gritty Spanish 2 is a lot more than hookers and love triangles. You’ll also find conversations like Job Interview, Lost Cell Phone, Haircut, Movie Talk and Dentist Appointment. You get PDF files that have the English and Spanish side by side to make following along with conversations and translating a breeze. There’s a PDF for each dialog and one PDF that contains all the episodes. You also get a second set of EBooks specially formatted for mobile devices. The EBooks/PDF’s are very professionally done and look wonderful, as you can see below. These PDF’s are just as awesome as they were in Gritty Spanish I, but with a major improvement. The PDF’s allow you to click on any bold or underlined word and be taken to it’s definition in the Notes section. Clicking the word again takes you back to your place in the dialog. How cool is that? What are the benefits of Gritty Spanish 2? If you look closely at the image of the pdf above, you’ll notice that not only does it show you the names of the characters in each episode, it shows you the accent of the character as well. Spanish accents vary a lot. Some are clear and easy to understand and some aren’t. You’ll hear accents from the Dominican Republic, Puerto Rico, Venezuela, Guatemala, Mexico, Colombia, Bolivia, Argentina, Spain, and Ecuador to name a few. After all, the more accents you expose yourself to the better because you never know who you’re going to run into. I don’t think I have to tell you how fast some Spanish speakers talk. 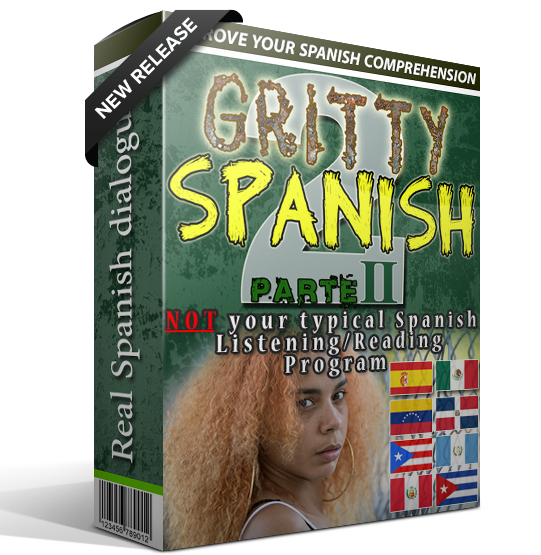 Gritty Spanish 2 allows you hear Spanish spoken at various speeds and if it’s too fast for your still maturing Spanish ears you can use the transcripts to follow along, use the 30% slower dialogs, or both. No doubt about it, you will learn a ton of very common, everyday useful vocabulary and expressions with Gritty Spanish. The conversations in Gritty Spanish are specifically written to mimic everyday conversations and real life situations. You won’t find any overly stuffy formal Spanish here. The dialogs do a great job of reflecting how Spanish is spoken in real life and you’ll get good sense of how to speak as naturally as any native speaker. The good news is you can actually sample Gritty Spanish 2 or even sample Gritty Spanish 1 before spending your hard earned cash. If you decide Gritty Spanish is for you, there are several versions of Gritty Spanish to choose from, but no matter which one you choose you’re going to have funs listening and improving your Spanish at the same time. Did you like this lesson?